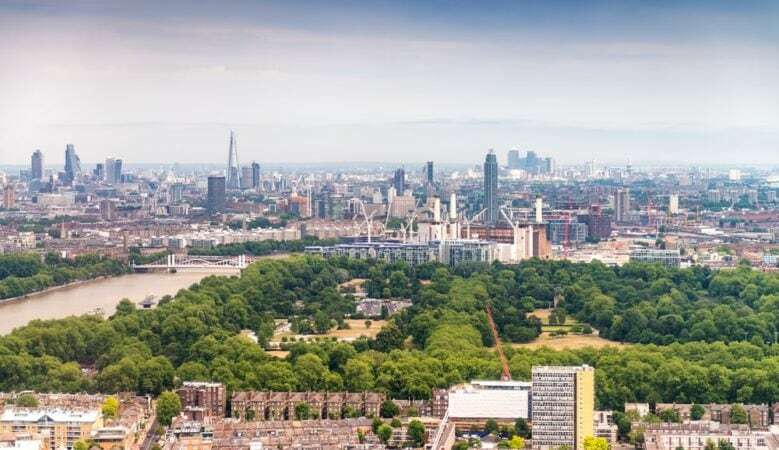 On average across London’s boroughs, 31% of the landscape is covered by green space and with an average house price of £530,201, Londoners are paying £245 per square metre in property prices for being near a park. The borough of Havering has the largest as a percentage of overall green space at 59%, while at the opposite end the City of London offers green space totalling just 5% of the boroughs overall landscape. The figures come from research by agents Benham and Reeves which looked at where offers the best option when considering the cost of property in relation to the amount of green space available. The cheapest is Bromley, where 58% of the borough is classed as green space and with an average house price of £443,289, Bromley is home to a green space property cost of just £5 per square metre. Havering comes in a £6 and Hillingdon at £7 and both are also home to a property to green space cost of less than £10 per square metre while Enfield and Croydon have some of the greenest affordability in the London property market. However, at the other end of the table and with green space accounting for just 5% of the borough’s total land, the City of London’s high property prices mean homebuyers are facing a cost of £5,368 for every square metre. While green space accounts for slightly more of the landscape in Kensington and Chelsea at 15%, the borough is also home to a property to green space cost of £753 per square metre. Islington, Hammersmith and Fulham, Westminster, and Camden are also home to some of the worst ratios for property price affordability and plenty of green space. ‘In any city, the availability of green space, parks and other areas in which to spend the long summer days are going to be sought after amongst home buyers as, unlike those in the rental sector, they are committing to a longer life in their chosen location and often the next stage of family life,’ said Marc von Grundherr, director of Benham and Reeves. ‘Across both the rental and sales sector, properties with a balcony can often command a far higher price, particularly if they aren’t close to a park or open space, simply due to the fact that we love to have the option to sit outside when possible,’ he pointed out. ‘But the great thing about London’s market diversity is that living close to green space doesn’t necessarily have to break the bank and when looking to the capital’s peripherals, in particular, you can secure far more green space for a much more affordable property price,’ he explained. ‘Depending on your lifestyle, the close proximity of green space can be up there with other important amenities and so for those looking to sell in these tougher market conditions, showcasing surrounding features such as a great park, is as important as showcasing the property itself,’ he added.